Nintendo of Japan Hiding the Upcoming Surprise? 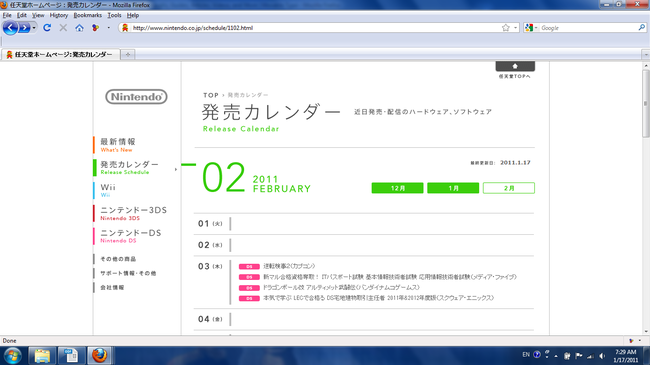 Given that Nintendo of Japan recently updated their 3DS release calendar for March, it’s a bit surprising to see that even after the weekend they still haven’t updated the full release calendar for that month to include non-3DS titles. We know that there are some surprises planned for Nintendo World in Europe and America – perhaps they’ll holding back some non-3DS info until the big event Wednesday? Either way, it’s hard to believe that Nintendo doesn’t have anything up their sleeves for Wii in March, and if they don’t, why does the 3DS have its own March calendar rather than its schedule simply being dumped into the main one? Something’s going on here. Nintendo, you sly dog, stringing us along as usual, eh? We’ll find out Wednesday, so check back here for whatever news (or not-news) surfaces at Nintendo World.